We develop image analysis methods for quantitative analysis of medical images, specifically for a range of applications in cancer. (Left) A mammogram; at point a, we estimate 3.6cm fat, 2.4cm of dense tissue; at point b, 5.8cm of fat; 0.2cm of dense tissue. (Right) quantitative measurement of the amount of dense tissue in the breast. 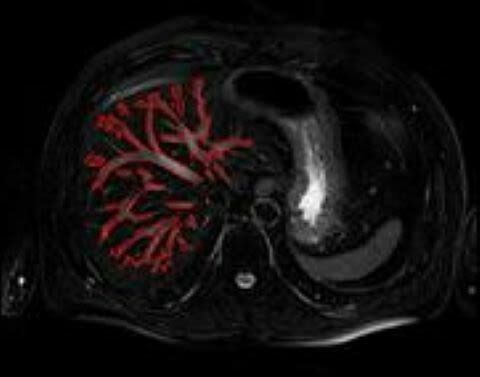 Image analysis based on MRI, CT, PET, SPECT, ultrasound, and various forms of microscopy, is firmly established as a basis for detection and diagnosis of disease and for illustrating aspects of the fundamental science basis of cancer. In practice, much of image analysis is qualitative in that it relies upon the judgement of experts to interpret the images. We aim to develop precise measurements from images, enabling us to: monitor the progression of disease; measure the response to therapy; and to estimate physical aspects of tumours, such as their size and density. Some of many examples of our work include: measuring from a mammogram the amount and distribution of dense tissue in the breasts of post-menopausal women (currently regarded as one of the main risk factors for breast cancer); identifying complete responders to neoadjuvant chemo/radiotherapy in colorectal cancer (potentially avoiding major surgery); and classifying liver textures, such as those characteristic of a range of liver diseases. Figure 1 illustrates some of our quantitative analysis of breast density estimated from a single mammogram. 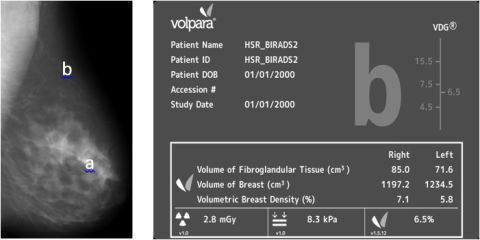 Note that the volumes of fibroglandular tissue is expressed in cm3 while the x-ray dose estimated as a result of this particular mammogram is 2.8 mGy. Our work forms the basis of the products of VolparaSolutions, a company we founded in 2008 based on science we did in Oxford starting in 1993. Figure 1: (Left) A mammogram; at point a, we estimate 3.6cm fat, 2.4cm of dense tissue; at point b, 5.8cm of fat; 0.2cm of dense tissue. (Right) quantitative measurement of the amount of dense tissue in the breast. These applications rely upon, and motivate the development of, advances in image analysis techniques: image segmentation; feature extraction; deformable image registration; atlas development; and tumour modelling. Figure 2 shows the vasculature computed automatically for one slice of an MRI volume of the liver. This is used subsequently to detect and stage liver disease. Learning new parts for landmark localization in whole-body CT scans.